You are looking for a nano. It is not inside the church grounds but is not far away. 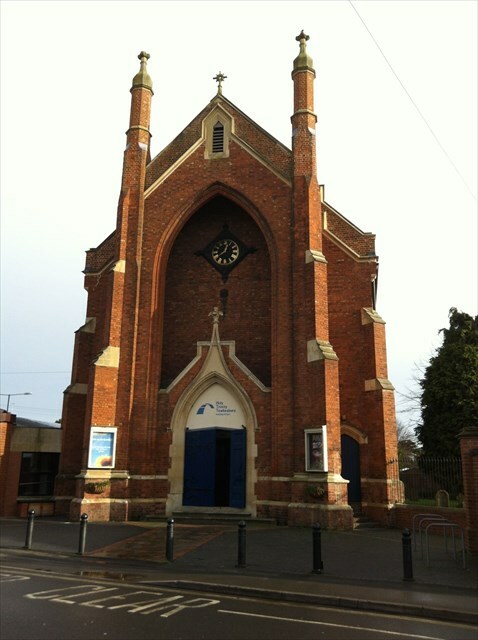 This church was built to serve a rapidly expanding area called The Oldbury, built up after the enclosure of Oldbury Fields in 1811. It was consecrated in 1837. The town council opposed the formation of a new ecclesiastical parish in 1849, and Holy Trinity parish was separated from the parish of the abbey church only in 1893. The church, now in the Diocese of Gloucester, contains various tablets, and, left of chancel, a dedicatory panel to the benefactor, John Terrett. Ybbx sbe gur terl cbfg.